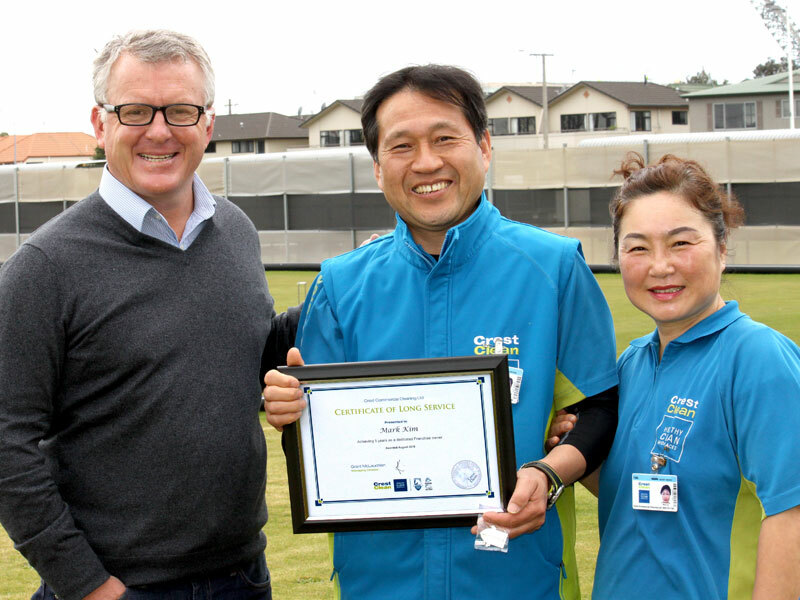 Mark Kim and Nancy Lee receive their Certificate of Long Service from Grant McLauchlan, CrestClean Managing Director. CrestClean’s Tauranga personnel have been encouraged to join the “next generation” of franchisees by ramping up the size of their business. Speaking at the region’s annual team meeting, the company’s Managing Director Grant McLauchlan said nationally there was a growing trend for larger businesses as more franchisees were seeing the benefits of going fulltime. It was never a better time to expand, he said. CrestClean was a leading player in the industry and the brand was well respected in terms of providing a quality service, he added. “It’s become evident over the past 12 months that the high standards that we maintain as an organisation has put us in a very good position. Opportunities were abundant for people to diversify their businesses into specialist areas, such as property care, carpet cleaning, hard floor care, and pure water window cleaning, he says. CrestClean’s Tauranga Regional Manager Jan Lichtwark says business is booming in the city for the company, fuelled by new developments throughout the CDB and in the new suburbs. Customers new to the company have included several medical centres, kindergartens and schools. Over the past year more of his teams have taken the decision to expand their business by going fulltime with CrestClean, he says. “People can see that it’s far more beneficial to give up other jobs they have and concentrate all their efforts on their CrestClean franchise. Jan says he’s also noticed a shift in the calibre of people now buying a cleaning franchise. “We are seeing more people who are viewing the commercial cleaning industry as a long term profession rather than just a job. Several long serving CrestClean franchise owners received awards at the team meeting. They included husband and wife Mark Kim and Nancy Lee, who have reached their five-year milestone. Anna Susanti and John Santosa who have been with CrestClean for three years. 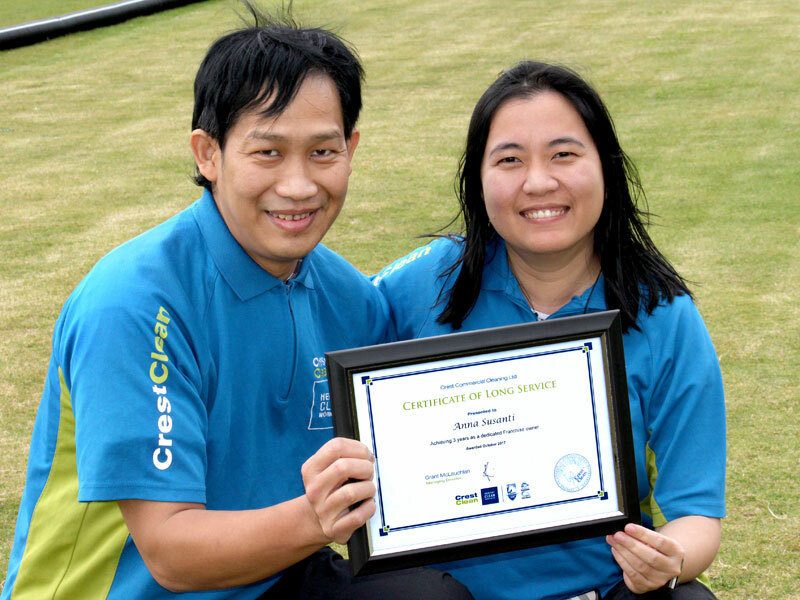 Jan says the couple are great ambassadors for CrestClean. “They certainly put everything into their business. They look after two schools in the city and are well respected there. “It’s great to see them getting their long service awards. They are really proud of what they’ve achieved. They have referred a number of their friends to CrestClean who have gone on to purchase franchises. Also commended were Anna Susanti and John Santosa, who have been with CrestClean for three years.